Do you like princesses? Do princesses make you excited? If your answers are yes, you can’t go wrong with this amazing inflatable! 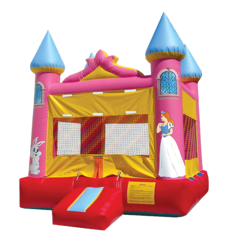 Perfect for the youngsters that love those crazy princesses! They get a generous jumping area to act like perfect princesses and they are shaded to boot! Surrounded by shaded enclosed netting a breeze is the best thing to flow through.